This page is a quick-start guide that helps you get started using the Reactor application. To get started with Reactor, install the JChem package of ChemAxon firstly. For detailed instructions on the installation procedure, see our JChem Installation Guide. Once Reactor is installed on your computer, you are ready to start your virtual reaction. After launching Reactor, you will be asked to specify your reaction that defines the chemical transformation to be performed on your molecules. 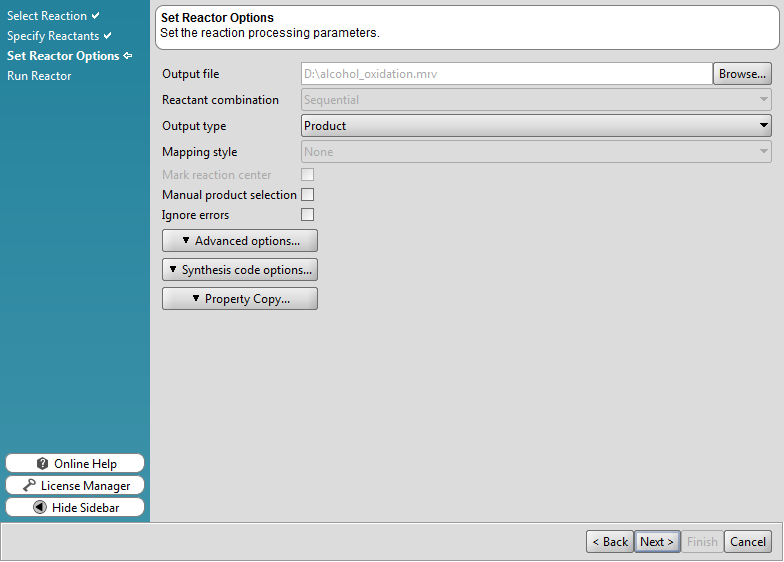 The easiest way to provide a ready-to-use reaction for Reactor is to select a predesigned reaction from the reaction library created and maintained by ChemAxon chemists. 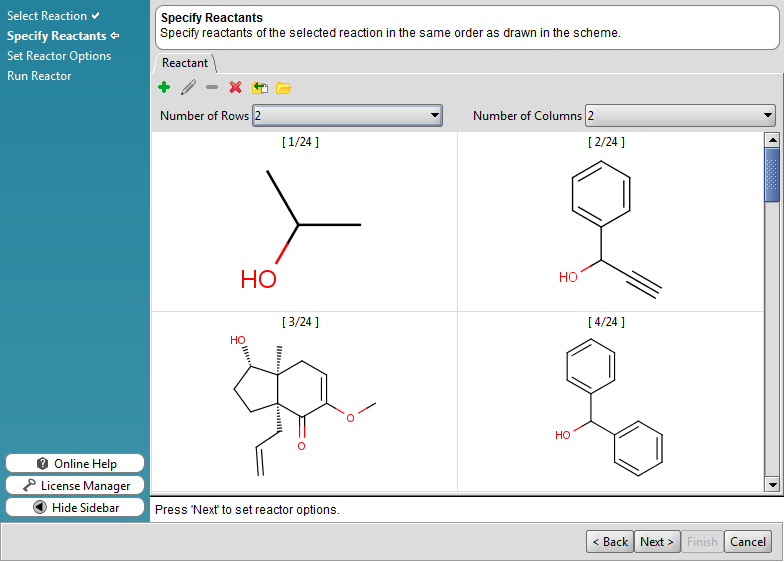 Besides selecting a predesigned reaction, you can also enter your custom reactions into Reactor. In the subsequent step, you have to provide your input molecules that will be used as reactants. 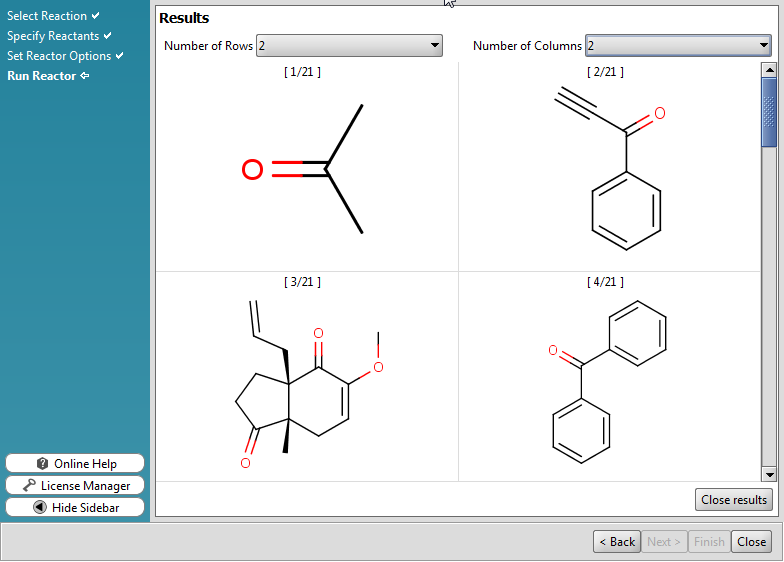 You can either directly draw your compounds or upload them from a file. A set of example starting materials are also supplied as reactants for a ChemAxon-curated reaction. To learn more about this step, visit Specifying Reactants. Then select the location of the output file that will contain the results of the virtual reaction. Besides entering its name, you can also choose from a wide range of file formats here. You can also specify your output type on this panel that determines how the results will be visualized. After you have completed the previous panels, a Summary sheet will be offered to you where you can review all your settings. If you accept this sheet, Reactor will start running on your compounds according to the given reaction. Once ready, Reactor displays a Results sheet that summarizes the most important details of your virtual enumeration process (e.g., the number of reactions done). You can review the results of your virtual enumeration conveniently through the Reactor GUI. The enumerated compounds can be easily browsed and analysed visually as a final step. 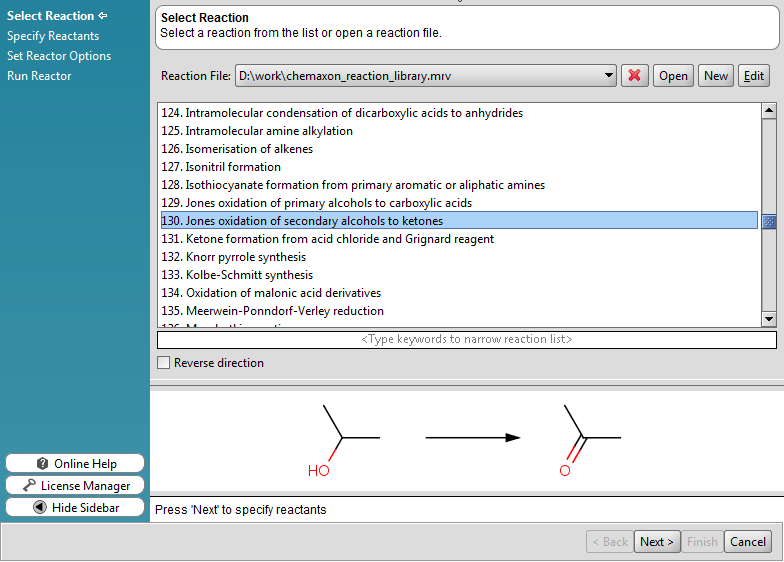 The newly created molecules will be stored in the given output file as well. Visit Working with Reactor to get more details on how to work with Reactor!